[ Warwick Deeping, novelist. ] 5 Autograph Letters Signed and 3 Autograph Notes Signed to Margaret Greenwood, regarding the adapation of his work for film. 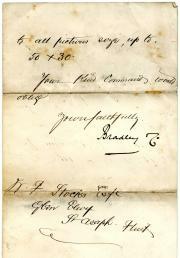 With 3 Autograph Letters Signed from his wife, and 13 copies of Greenwood's letters. On blind-stamped letterheads of his country house Eastlands, Weybridge, Surrey. 1949 and 1950. 21 items. In good condition, lightly aged, held together with a brass stud. Deeping's eight items of correspondence - all signed 'Warwick Deeping' - total 9pp. His wife's three letters total 4pp. One of Deeping's letters is in its envelope, addressed by him to 'Miss Margaret Greenwood | 15 Horsham Road | Bexleyheath | Kent'. The copies of Greenwood's typed letters, totalling 16pp., date from between 27 July 1949 and 22 July 1950, bookending the whole correspondence. They are written on the backs of discarded typed drafts of pages from Greenwood's screenplays. Place not stated. 25 May 1905. 48pp., folio. Each page on the recto of a leaf, and all 48 leaves held together by a brass stud. In fair condition, on aged and worn paper. Authorship or ownership inscription on title page: 'A. E. Bullock | 43 Chancery Lane | W. C.', with autograph note: 'An Essay written originally for a prize, I believe. 20pp., small 4to (16.5 x 13 cm). Sewn in card wraps, illustrated in colours. In fair condition, lightly and spotted, in worn wraps, with two uncoloured illustrations on the inside wraps coloured in. 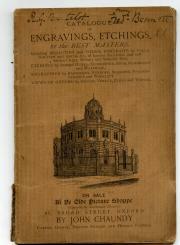 With ownership inscription on half-title, dated 18 September 1927. Eight attractive full-page colour illustrations (two out of register) in text, in a range of styles, suggesting stock images by different illustrators, and two uncoloured illustrations on the inside wraps, coloured in (by a child? ), with another two illustrations on the front and back covers. This item is something of a mystery. Autograph Letter Signed from 'F. Cook' to the Secretary of the French Exhibition in Pall Mall, requesting the return of a painting 'by Mr. L. Veneaux', with reference to Ernest Gambart. 4 Childs Place, Temple Bar [London]. 12 April 1860. 1p., 12mo. Good, on lightly-aged paper. He has been 'requested by Mr. L. Veneaux to desire you to return the Picture (Boulonaise) which was delivered at your Gallery at the last Winter Exhibition but being a French Picture was not Exhibited, but allowed to remain for the French one'. He has already made an application 'in Berners Street and Mr. Gambart said the proper place to apply to was at the Gallery.' Graves claims 'L. Veneaux' as a misprint for 'V. Vemaux' of 30 Piccadilly, who exhibited 'Souvenir of Eguihen, near Boulogne-sur-mer' at the Royal Academy in 1853. Autograph Receipt Signed by the Austrian art dealer Charles Sedelmeyer of Vienna, for a painting by T. Schmitson of Vienna, for an exhibition by the London art dealer Ernest Gambart. 1p., 12mo. In fair condition, on lightly-aged paper. The receipt reads: 'Pour l'exposition de M. Gambart: | un tableau par T. Schmitson de Vienne representant des chevaux sortant de l'abreuvoir | prix (nette) frcs. 1500. - | Londre, le 30: Juin 862 | Charles Sedelmeyer | m[archan]d. de tableaux de Vienne'. Sedelmeyer has written some calculations in the bottom right-hand corner, and at the foot: 'Received back the above | Sedelmeyer'. 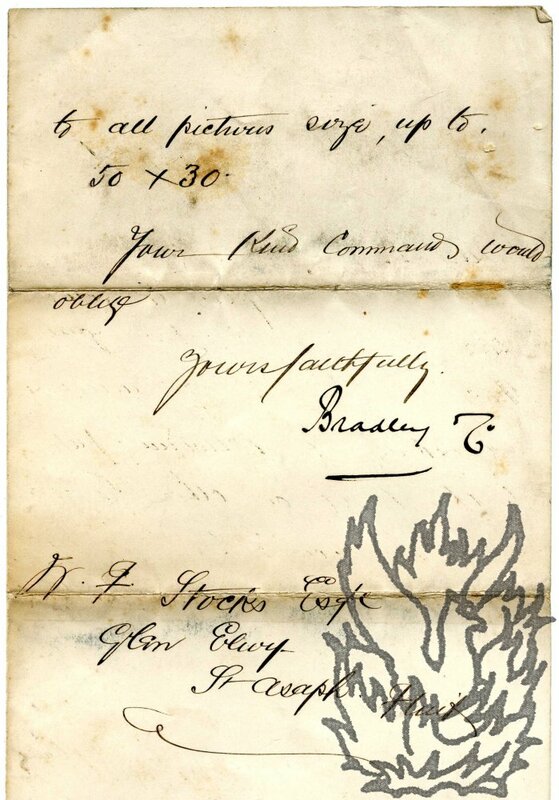 Autograph Letter Signed ('C H A B') from Rev. Charles Harris Alured Barling of Brook Lodge, Norfolk, to 'My Dear Beevor', expressing dismay at the result of a visit by the auctioneers Christie's to view the pictures of Clarke Stoughton of Bawdeswell. Letter: Brooke, Norfolk. 8 April [no year]. List of pictures with reference to a letter of 25 April 1868. Letter: 6pp., 12mo, on bifolium and single leaf. An vivid and entertaining letter, shedding light on Victorian valuation and auctioneering practices. Barling wastes no time in passing on the bad news. 'I am very glad you have written to me about the B[awdeswe]ll. pictures & I can tell you [last world underlined] plainly what the 2 Christie's opinion was which I cd. not do to poor old C[larke]. S[toughto]n. The inspection in issue was a grievous disappointment. So far worse than I cd. have possibly believed, and then coming the question cd. two such Men as the Christies be wrong? Autograph Letter Signed from John Wishaw, Secretary to the African Association, to the Whig MP James Loch of Bloomsbury Square, regarding the picture galleries of Lord Stafford and Lord Grosvenor, also George Canning, Lord Brougham and elections. 9 May . 'L. I. Fields' [i.e. Lincolns Inn Fields, London]. 2pp., 12mo. 40 lines. Bifolium. Good, on aged paper. The reverse of the second leaf carries half of a red wax seal, as well as the address to 'James Loch Esqr | Bloomsbury Square'. The letter begins: 'My dear Loch | Some friends of mine from the Country are desirous of seeing Lord Stafford's & Lord Grosvenor's pictures some time next week; & they understand that the obtaining of Tickets is not a matter of course but that some little interest is necessary.' He asks for assistance 'with regard to Cleveland House [...] for Mrs Johnston & party (about 5 or 6 persons)'. 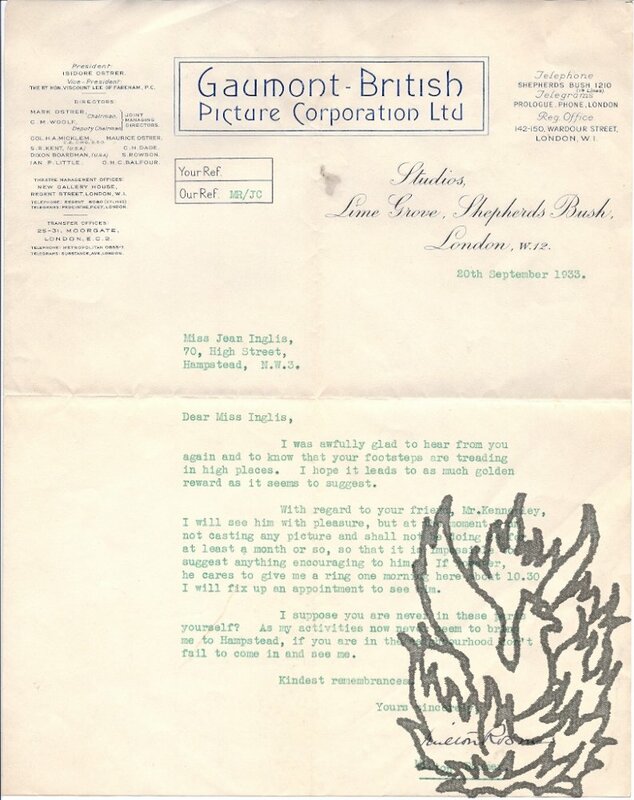 Typed Letter Signed from the English actor and film director Milton Rosmer to the artist Jean Inglis. 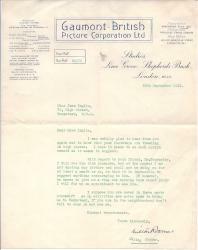 20 September 1933; on letterhead of the Gaumont-British Picture Corporation Ltd.
4to, 1 p. 15 lines. Text clear and complete. Fair, on aged paper. In green ink. He is pleased that her 'footsteps are treading in high places', and hopes that this 'leads to as much golden reward as it seems to suggest'. He will see her friend 'Mr. Kennerley', but he cannot be 'encouraging' as he is not at present 'casting any picture', and will not be doing so for 'a month or so'. His 'activities now never seem to bring [him] to Hampstead', he hopes she will see him when she visits his 'neighbourhood'. Nine glass slides of photographs of British nineteen-twenties ice cream manufacture. All nine slides bound in 8 cm glass squares, with the black and white images themselves in good condition and unfaded. The slides, apparently from a newspaper library, all carry labels with captions and the shelf-mark 'M74 Box 286 637.1'. Evocative and instructive images, apparently all dating to the 1920s. Captions of 'engine rooms and compressors', 'machine filling one third three flavour blocks', 'mixing and pasteurising', 'hardening room', 'ice cream packaging machine', 'three double packing machines', 'making', 'two chocolate ice machines', 'mix storager tanks'. Manuscript Letter from Bradley & Co., 'Picture Frame Makers, Packers & Conveyancers, Exhibition Agents' to the artitst W. F. Stocks, giving their charges for delivering pictures to the Royal Academy. London, 14 March 1903; on Bradley & Co. letterhead, 81 Charlotte Street, Fitzroy Square, London. 12mo, 2 pp. Bifolium. Written out in one hand, and signed 'Bradley & Co' in another. Addressed to 'W. F. Stocks Esqre | Glen Elwy | St Asaph. | Flint[shire]'. Thirteen lines. Text clear and complete. On foxed and lightly-aged paper. Giving the firm's 'charge for receiving unpacking & delivering pictures to the R.A. or other London Exhibitions' and for 'collecting repacking & forwarding', as well as the dimensions of pictures for which these charges apply. 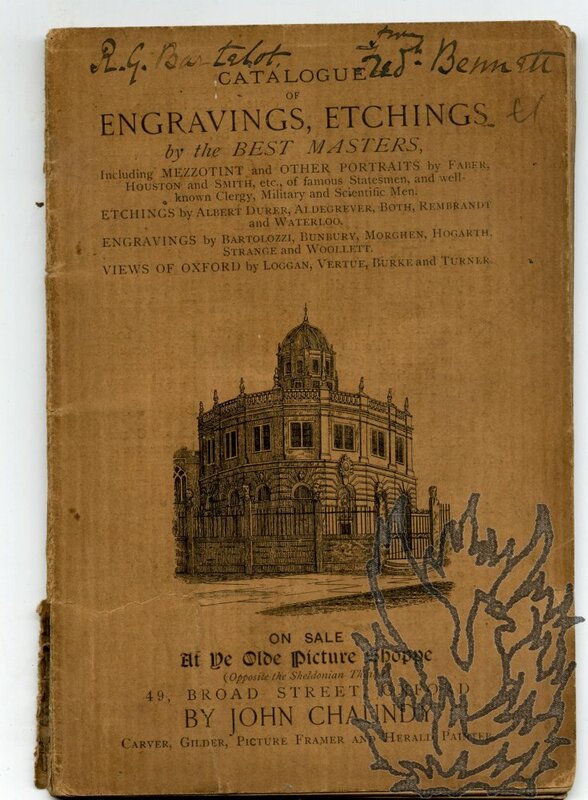 Catalogue of Engravings, Etchings by the Best Masters, Including Mezzotint and Other Portraits [...] Views of Oxford by Loggan, Vertue, Burke and Turner. 12mo, 61 pp. In original brown printed wraps. Engraving of Sheldonian Theatre on front, otherwise the item is not illustrated. 2864 items, ranging from '1 AARON, Rev. born 1695, engraved by Vertue. 5s 6d' to '2864 Zonelli (Anton. Maria) after Joan. Anton. Faldoni, Man blowing Horn, with hounds. 5s'. Fair, on aged paper, with a few leaves dogeared, in worn wraps chipped at extremities, and with 4.5 cm closed tear at foot of spine. Presentation inscription at head of front wrap: 'R. G. Bartelot. from Fredk. Bennett'. 14 February 1825, <West hill?>. Celebrated connoisseur (1758-1833), whose picture-gallery, one of the finest in Europe, was at Bridgewater House in London. One page, 12mo. Formal letter in the third person. "The Marquis of Stafford sends his Compliments to Sir Egerton & requests that his name may be continued as Vice President for the Theatrical fund of Covent Garden Theatre, though he regrets that his health will not permit him to attend." Negligible traces of previous mounting on reverse. Typed Letter Signed to G. K. Menzies[, Secretary], Royal Society of Arts. 24 November 1932; on letterhead '126 WIGMORE STREET | W.I'. British architect (1883-1952) who worked on 'the Bath Improvement Scheme, Saint Catherine's Church, Hammersmith, W., The Regent Theatre, Brighton, The Picture House, Edinburgh, Gresham Hotel, Dublin, and many private and other works' (Who's Who). One page, quarto. Very good. Docketed and bearing R.S.A. stamp. Headed 're Architectural Decoration Committee'. He assumes that 'the Agenda of a meeting of your Committee on the 30th November at 4 p.m.' has been sent to him in error, as he has written a letter declining the invitation to serve on it. Autograph Letter Signed to Mrs Bewick[e]. Art dealer (1825-1910; DNB). 2 pages. 16mo biofoliate. In good condition. The recipients name is spelt 'Bewick' at the beginning of the letter and 'Bewicke' at the end. 'Dear Mrs Bewick | I came up from Southampton on Saturday. I am starting for Lancashire in a few minutes | I shall be back on Wednesday and off the following day | I can see you here if you can call about 5.30 | Yours sincerely | Wm Agnew'.